Life doesn’t always go according to plan, but sometimes it can turn out to be the greatest gift in the world. 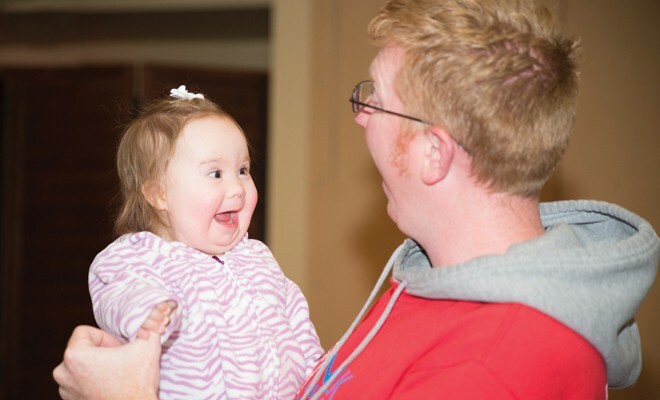 This was the case for Angela and Andy when they gave birth to their daughter, Brinley, and found out she had Down Syndrome. It was a surprising diagnosis, as it was missed in the ultrasounds, but Brinley has been an incredible blessing to their family. Angela and Andy knew it was important to get Brinley into a children’s therapy program as soon as possible. After heart surgery at 10 weeks, Brinley’s parents found Easter Seals Children’s Therapy program and it has made all the difference. A trusted provider of children’s therapy services for more than 65 years, Easter Seals Delaware & Maryland’s Eastern Shore specializes in treating children ages birth through 18 years with a variety of challenges. Easter Seals specializes in meeting the needs of children and their families through creative, playful activities that go beyond traditional services. More than 275 children per year receive physical, speech and occupational therapy at the Easter Seals Children’s Therapy Center in Dover. Easter Seals plays a critical role in providing needed therapy for children with a variety of disabilities, short or long term. Children with and without disabilities will find the highest quality services designed to meet their individual needs. For more information about Easter Seals Children’s Therapy services call 302-678-3353.